Who has the most at stake (player or coach) over the next few weeks? Chantel Jennings (national college football reporter): Clay Helton. Making midseason changes is always risky, so USC will need to show offensive progress with him at the helm of the play-calling duties. If the group continues to sputter, it’ll be a reflection of the decision-making of Helton. If the unit shows progress, it’ll be a reflection of the decision-making of Helton. 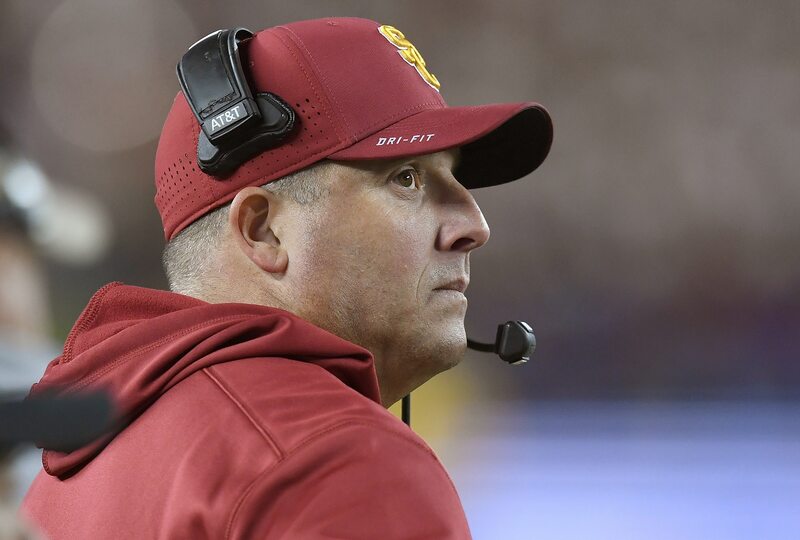 Doug Haller (Arizona State football reporter): USC coach Clay Helton. By program standards, this team is struggling. Attendance isn’t great. If the Trojans win the South and put up a good showing in the Pac-12 Championship Game, then all is probably forgiven. If they stumble, losing to Cal or UCLA or both, this could get ugly. Antonio Morales (USC football reporter): Clay Helton. USC’s season has been hectic, the team has underperformed, Helton has already needed to make staff changes, and I don’t think many people would be stunned if he wasn’t the head coach next season. Winning a division title, while starting a true freshman at quarterback, would strengthen his cause, though. Question T96 — Why should CH not consider starting Sears for the CAL game, but then possibly put him in for the Irish in the Coliseum? I’m just curious. Personally, I don’t care which QB plays, so I have no dog in this hunt. I do agree with you, playing Daniels now is pointless and opens the possibility to get him hurt. He is scared to death to be out there behind that line. Funny how Sears didn’t have a lot of trouble. Play Sears now!! Wasn’t hiring Tee Martin a reflection of Helton’s decision making already? He has proven that he is not the coach to run this program moving forward. Why are people still pretending like he might turn it around? I doubt anything will happen until USC has a new President. Why? Where do you get this idea? The BOT can make any change they want. And they are the ones who make the changes if a school president is there. So why couldn’t they make the change now??? It’s a great smokescreen excuse. The BOT doesn’t want to make any changes now and they don’t want the task in general. They’ve got enough trouble on their hands trying to find a new president and dealing with the fallout of Nikias’s messes. I hear they’re kind of a divided board anyways. That’s not conducive to hiring new HFC (which they really aren’t qualified for anyway), while that decision can later be pawned off on the new president. Swann wants CH through 2019 at least. JMHO. It is a smokescreen. I do think that there will be changes made. That Helton will be fired at the end of the year. With all the money spent on the new Coliseum and the donors who have paid for the luxury suites…and now the professors having to pony up $3-7,000 per year to keep their seats on the ‘sunny’ east side of the stadium, I doubt they want a low quality product on the field. Even Michigan with their loyal fans balked bid time a few years ago in the similar scenario. Do you think USC will be willing to go full boat like MICH and pay supreme dollars for a hugely visible, highly-desired college HC? Perfect summary of where we are, Allen, and spot on me thinks. Until USC pulls it’s [blank] out of its [blank], we going to have to measure our quest for a return to greatness more in terms of geological time or dog years than the way we’ve been expecting it. I am afraid you are right Rock. I am still very bothered by SC’s handling of Bubba Bolden. This presumed guilty until proving innocent crap has to stop. Otherwise we are no better than China, the former USSR or Nazi Germany for that matter. We are a free society that assumes innocence until proven guilty without one ounce of doubt. SC’s pc’s culture needs to change and change quickly or I can see my fellow alumni start to stop donating money to the school. I hope my others will take a stand. All I will say is that I would be a lot more of a believer if we had played someone better that Ore St. I just can’t believe it til we play and dominate someone a little better. Let’s see what happens this tomorrow night. And are you now thinking we are going to beat ND??? Haven’t we both drank enough Cool Aid this season already? Notre Dame’s beatable, especially with a hurt Book. Maybe not by USC, but it’ll be a final Coliseum game and maybe USC will remember what it was like to get shellacked by the Irish last year. We owe them bad. That’s got to be worth something. I figure ND will be seven point faves. Plus ND has to play SYRA in Yankee Stadium the week before. That shouldn’t be an easy roll-up game. Allen, put down the Kool Aid and take a step back. That stuff is dangerous. Bobbo — I’m not predicting a USC win. My Kool-Aid isn’t that strong! That’s what they all say. I am the same. By kickoff, we will be true believers. That is the essence of college football rivalries. I Think it should read; “Who has most at stake, Coaches, players,or FANS ?